Judy Yoder gets another tray of her addictive doughnuts ready for the fryer. Restaurants can be packed for brunch on Saturdays and Sundays. If you have children — or just are impatient and starving — you can head to one of the many farmers’ markets across town. 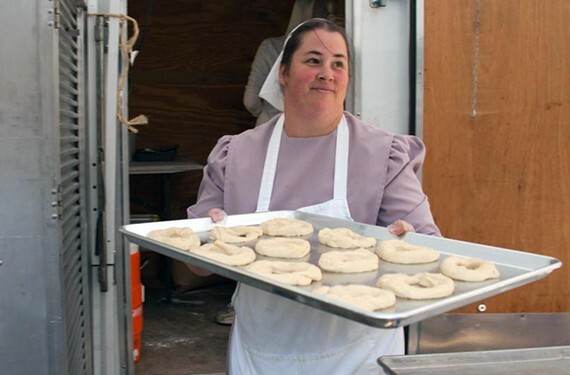 South of the James Market (New Kent Avenue and 43nd Street) has a bevy of food trucks serving breakfast options — and that’s the spot Mrs. Yoder’s Doughnuts lands each Saturday. Need we say more? Well, yes. GrowRVA started a new Sunday brunch market at the Glen Allen Cultural Arts Center (2880 Mountain Road) held each Sunday from 11 a.m. to 3 p.m. You’ll find food trucks, kids’ activities, live music and artisan vendors. The Market at St. Stephen’s (6000 Grove Ave.) is a paradise of baked goods, from La Bella Vita Bakery to Rina Factory Home Baked Goods, plus a few food trucks. And make sure you check out all the markets near your neighborhood, from Lakeside to Chester, and grab a few vegetables for the week while you’re snacking on breakfast.